Patients are "competing for beds" at Shropshire hospitals, according to a consultant there. Dr Andrew Tapp was speaking about the Future Fit scheme which would see care divided between two hospitals in the county - one for planned care and one for emergencies. Dr Tapp said splitting emergency and planned care onto separate sites would improve services. Others fear the proposals will lead to a "hugely greater pressure" on beds. The Local Democracy Reporting Service said Dr Tapp, medical director for Women and Children Services at the Shrewsbury and Telford Hospitals NHS Trust (SaTH), told a meeting on Tuesday: "When I do my rounds I don't know who is going to get a bed and who isn't. "I would be able to if we sort out the elective patients from the emergency patients," he said. 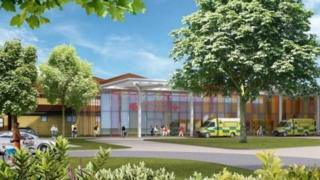 The plan to radically overhaul the hospitals in Telford and Shrewsbury has been granted £312m of government funding. In 2017, local health bosses agreed an option that would see emergency care and women and children's services located in Shrewsbury. The Telford site meanwhile would become the centre for planned care, such as elective surgery, orthopaedics and specialist bariatric and breast services, yet see its emergency department downgraded. Gill George, chair of Shropshire Defend Our NHS, which opposes the plans, said Future Fit "will take a crisis and turn it into a catastrophe". A public consultation on the proposals closes on 11 September. The trust is at the centre of a maternity scandal after it emerged more than 40 babies had died due to alleged poor maternity care.